Do you like to manage your health naturally, without medications or over the counter products that might as well be medications? For mild to moderate common acne, natural acne treatment can save money and help you do your part to keep chemical waste out of the environment, but there are some kinds of acne that are not suitable for being treated naturally. The most natural treatment for mild to moderate acne is moisture. Natural acne treatment does not have to cost anything at all—but can produce visible changes in your complexion fast. The most severe forms of acne, such as cystic acne, almost always need medical treatment. Don’t try natural methods on severe acne. Mild to moderate common acne and the form of acne known as rosacea respond to natural treatment. Simply adding humidity to your workplace or home can help keep your skin hydrated and your pores open. The dietary change for mild to moderate acne that really works is giving up snacks made with fake fats—basically anything in a cellophane wrapper that you can buy at a convenience stores. Natural treatment for rosacea mostly consists of what you don’t do. Avoiding extremes of temperature keeps rosacea in check. And the most natural step beyond natural acne treatment is Exposed Skin Care. If you have mild to moderate common acne, there is almost no doubt you can benefit from natural acne treatment. If you have blackheads, whiteheads, and/or pimples, no more than 25 on your face, natural remedies will probably make a difference. 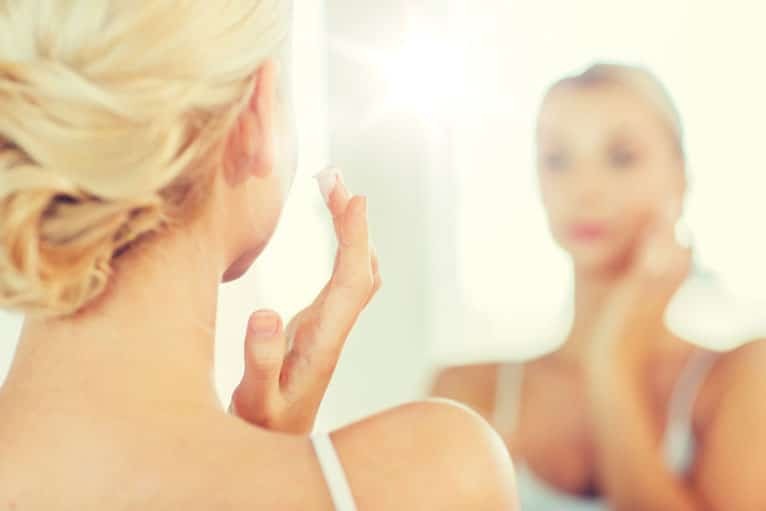 Acne fulminans, a condition that causes both joint destruction and severe pimples, usually after use or abuse of steroid drugs, then you need to see a physician for medical treatment. Natural treatments work best in the mildest cases of acne. What sorts of natural treatments help clear up mild to moderate common acne? The simplest natural therapy for mild to moderate common acne that really works is moisture. Moisture in the atmosphere helps maintain moisture in your skin. Simply running a vaporizer or a humidifier, or turning off forced air heating for several hours a day, can help your skin retain enough moisture to keep pores open so blemishes don’t form. It isn’t helpful to drink large amounts of water, although at least 5 cups (1.2 L) per day are essential for preventing dehydration of the body and the skin. Moisture also helps loosen whiteheads and blackheads. All you have to do to help clear up non-inflammatory blemishes is to soak a clean washcloth in warm water and then lay it on affected skin for 10 to 15 minutes. Don’t start squeezing as soon as you remove the washcloth. It’s best that you never squeeze blackheads or whiteheads at all. Most people miss and just damage surrounding skin. But a humectant treatment speeds up the opening of the pore and the clearing of the blemish. What About Foods For Mild To Moderate Acne? The changes in diet that make a difference in acne might surprise you. Fat is not the problem. “Fake fat,” such as margarine or partially hydrogenated cooking oils (used to make snack foods that come in cellophane wrappers, such as chips/crisps and cookies/biscuits) increases acne inflammation. Butter, cheese, and moderate amounts of animal fat actually help clear up acne—although should not go out of your way to consume them. You just don’t need to avoid them. Nuts are usually not a problem for acne, although they can set off attacks of cold sores. The old stories about dark chocolate, however, turn out to be true. In susceptible individuals, eating 2 or 3 Dove bars or other dark chocolate treats can set off an outbreak up to 80 to 100 new pimples in just 4 or 5 days. A small indulgence in dark chocolate can cause huge problems for your face. Natural approaches to managing rosacea tend to focus on what you don’t do, not what you do. Key to keeping rosacea in check is avoiding sudden warming of the skin. In rosacea, the walls of the capillaries that carry blood to the basal layer of the skin are weak. Heating the blood causes it to expand and break capillary walls. The break in the capillary wall can cause blood to leak, making a red dot on the skin. Or the blood in a capillary can clot, forming a purplish spider vein on the nose or around the eyes. When blood vessels break too often, they can form scar tissue, which makes the skin look bumpy, especially on the nose. If you have rosacea and you live in a cold weather climate, make sure to protect your face from the cold. That way your skin is exposed to less trauma when you come indoors. Avoid hot beverages, spicy foods, and any kind of skin care product that contains ingredients that leave your skin feeling tingly, such as alcohol, menthol, or wintergreen. Chew deglycyrrhizinated licorice (DGL) to kill Helicobacter pylorus bacteria in your stomach. DGL, unlike untreated licorice, won’t cause high blood pressure, but the DGL is only released from the supplement when it is chewed and the contents are mixed with saliva. Getting bacterial infections of the stomach, for reasons scientists don’t understand, sometimes gets rid of rosacea. And you might even find that vacuuming every week and cleaning your drapes every six months helps reduce rosacea symptoms, but killing a kind of mite that can infest the skin and make it more reactive to changes in temperature. Natural therapies for mild to moderate common acne and for rosacea don’t cost anything (or at least don’t require any expenditure you were not going to make anyway). They can make visible changes in your complexion in just days or weeks. No natural acne treatment—and no medical acne treatment—gets rid of all your blemishes overnight, or in just a week, or even in a month. But an acne treatment system called Exposed Skin Care gets rid of 96% of blemishes for 98% of users in just 30 days, and its makers are so confident their system can work for you that they offer a one-year money-back guarantee.